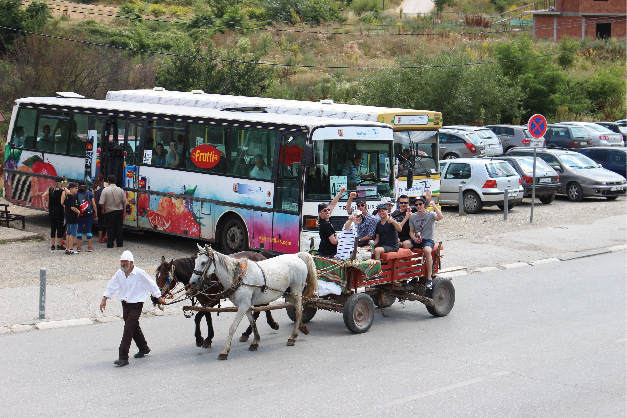 Although indicated by political issues, transport in Kosovo is relatively developed. Since the declaration of the independence, there have been many improvements in the infrastructure and urban transport. Pristina International Airport (PIA) Adem Jashari (IATA: PRN, ICAO: BKPR) is an international airport located 15 km southwest of Prishtina. Since 2010, PIA is being managed by Limak and Aeroports de Lyon through Public Private Partnership Agreement. It has a 42,000 meters square modern terminal, handling over a million passengers per year. In June 2006, Pristina International Airport was awarded the Best Airport 2006 Award in the category of 1.7 million passengers per year. Winning airports were selected for excellence and achievement across a range of disciplines including airport development, operations, facilities, security and safety, and customer service. PIA serves different international airway lines and offers flights to the most important European destinations. There are almost daily flights to Zurich-Switzerland, Frankfurt-Germany; Vienna-Austria Ljubljana-Slovenia, Istanbul-Turkey; and much more. Domestic destinations accessible by rail include Pristina, Peja, Fushë Kosovë, Gracanica, Han I Elezit and Mitrovica. There is also a service to Skopje in Macedonia. Internal rail services are generally poor and less reliable then buses unfortunately. Nevertheless, if you do have the time to head out to/from Skopje by train the view will amaze you considering that it is very scenic. Traffic drives on the right. Road are not that good; however, they are getting better as most of them are being constructed or reconstructed. The maximum speeds are 80 km/hr in highways, 60 km/hr in main roads and 35 km/hr in urban areas. Drivers must use headlights at all time and have the fist-aid kit and yellow vest. From November 15–cars should have snow chains. As a heads up though, traffic jams are known to be very long especially in Pristina, so if you happen to be in the city, a recommendation of going-by-foot would be of good use. R6 Motorway (Arbën Xhaferi Motorway) which is under construction and is part of European Route E65. This motorway links Pristina with Skopje. R7 Motorway ( Dr. Ibrahim Rugova Highway) is part of European route E851 and links Kosovo with Albania. Car rental is the best way to solve your traveling problem. Both major international and local firms offer car hire at airports and larger towns. The daily cost for a small economical car is around Euro 60 per car. There are services between most towns, and most buses are comfortable with air-conditioning. Tickets are usually paid directly if there are any seats available. Buses in Kosovo are quite reliable and frequent and cover most of the country. For more information concerning Bus Routes the number of Prishtinas central bus station: (038)518-142/550-011. Main cities have metered taxis. It is possible to negotiate a fare when the meters are not in use. However, we suggest you to take a metered taxi as you will pay only the regular rate per km. In both cases ask if the car has a meter or agree a fare before setting off.